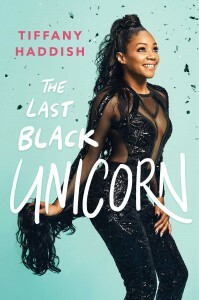 Gallery Books to Publish Tiffany Haddish | News and Corporate Information about Simon & Schuster, Inc.
NEW YORK, October 3 – Gallery Books, an imprint of Simon & Schuster, will publish THE LAST BLACK UNICORN by Tiffany Haddish, it was announced today by Jennifer Bergstrom, Publisher. THE LAST BLACK UNICORN is a side-splitting, brutally honest, edgy, and unflinching collection of (extremely) personal essays, as fearless as the author herself. Growing up in one of the poorest neighborhoods of South Central Los Angeles, Tiffany learned to survive by making people laugh. Tiffany can’t avoid being funny—it’s just who she is, whether she’s plotting shocking, jaw-dropping revenge on an ex-boyfriend or learning how to handle her newfound fame despite still having a broke girl’s mindset. Poised to become a household name, she recounts with heart and humor how she came from nothing and nowhere to achieve her dreams by owning, sharing, and using her pain to heal others. “Like a unicorn, Tiffany’s book is far beyond anything you’d expect to encounter—it’s magical,” said Bergstrom. Tiffany Haddish is a stand-up comedian and actress that is quickly establishing herself as one of the most sought-after comedic talents in television and film. Haddish was most recently seen starring in Universal’s Girls Trip alongside Jada Pinkett Smith, Queen Latifah and Regina Hall. In August she premiered her first stand-up special for Showtime titled Tiffany Haddish: SHE READY! From the Hood to Hollywood and her other upcoming projects include starring alongside Tracy Morgan in the new TBS show, The Last O.G., and starring opposite Kevin Hart in Universal’s upcoming film Night School. Past credits include roles in NBC’s The Carmichael Show, Jordan Peele and Keegan-Michael Key’s Keanu, and she has also made appearances in Mad Families, Chelsea Lately, My Name is Earl, It’s Always Sunny in Philadelphia, Def Comedy Jam, and New Girl, among others. Jeremie Ruby-Strauss, executive editor at Gallery Books, acquired world rights, including audio, from Byrd Leavell at Waxman Leavell Literary Agency. THE LAST BLACK UNICORN is scheduled for publication on December 5, 2017.